Review date: 6 May 1999. USB hubs are pretty simple appliances, and there's only so much a manufacturer can do with them. They can be basic beige (like this one) or funky blue (like this one) or built into a monitor, but the essential function is the same - one USB cable in, four (usually) USB ports out. Little lights, maybe. You plug it in and it works. One USB port becomes four. Or, if you're running a USB-unaware operating system, like pretty much anything but current Windows 98, very late model Windows 95 or current MacOS, you plug it in and it doesn't work. One would think there'd be little room for market segmentation, here. 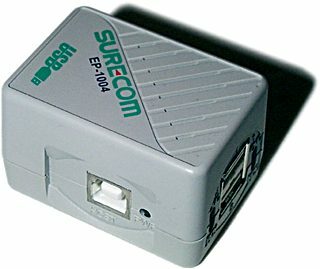 Surecom's EP-1004 has its own little claim to fame - it's small. Weeny. Teeny-tiny. About 55 by 39 by 35mm (2.1 by 1.5 by 1.3 inches), to be exact. There's barely enough room on the thing for the two USB output ports on each end, each of which is supplied with a green "ready" and red "overcurrent" LED. The input port's on one side, with its own power light, and that's it. The gizmo sells for about $75 (Australian dollars), which is significantly cheaper than the cool looking Skymaster hub I reviewed recently. Naturally, it comes with the the A-to-B cable needed to plug it in. The down side is that this is a pure "bus powered" hub, with no power supply of its own. This means it can only supply a total of 500mA of current to the four devices that can plug into it, and also means other hubs can't be "cascaded" from any of its ports. Larger hubs are usually dual mode - they're bus powered if you don't plug their included AC adaptor in, to make them self powered. For most users, a bus powered hub is fine. Most USB devices have their own power supply, or draw very little current (USB mouses and keyboards are very frugal), and you actually have to look pretty hard for anything that'll stress a bus powered hub. Is this an exciting product? Well, no. But if you're looking for a USB hub, and you don't need a self powered one, and you wouldn't mind having something roughly the size of a couple of stacked boxes of matches, as opposed to something the size of the average modem, then this would appear to be the hub for you. And it doesn't hurt that it's $25 or so cheaper. Universal Serial Bus is the enormously useful newfangled interface for various low to medium speed devices like mouses and modems and scanners. USB hubs supplement the two USB ports on recent PCs by plugging into one of them and providing four more. One end of the hub cable has the same flat "type A" USB connector as all USB peripherals; the other end is a square "type B" connector that's only seen on USB devices with detachable connector cables, like hubs. USB hubs can be "cascaded", by plugging hubs into other hubs. A USB hub that doesn't have its own power supply plugged into it is called "bus powered". Bus powered hubs draw their power from whatever they're plugged into upstream - a computer or another hub. They can't supply more than 500 milliamps (mA) to the devices that are plugged into them, in total. 500mA is plenty for four undemanding devices - things like scanners with their own power supply, and mouses that need very little power. Hubs with their own power supply are called "self powered". This includes those that are built into devices like monitors, and hubs like this Skymaster one, when it's got its plugpack connected. Self-powered hubs can supply up to 500mA to each of their ports. If you're cascading hubs, all hubs that have another hub plugged into them must be self-powered.